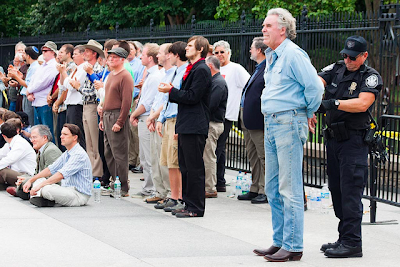 A tree-hugging protestor left a water bottle on the sidewalk by the White House and Algore flies on jets. Ergo there is no such thing as global warming? You've blinded me with your "science." OK, I re-read your post and I'm "trying again." How do you know the protestors didn't subsequently remove those water bottles? Do you have a subsequent photo of those water bottles with no protestors? Or a subsequent photo of a White House ground crew picking up those water bottles? Is it possible you are assuming the protestors did not subsequently remove the water bottles? I will stipulate that if in fact they left those water bottles behind on the sidewalk, I think such carelessness is irresponsible, especially for someone presenting himself or herself as an environmentalist. But even when another environmentalist acts irresponsibly, it does not cause me to doubt my own belief/opinion that we are facing a crisis. Conversely, if my opinion were that we are not facing a crisis, I cannot imagine my opinion being reinforced by the negative beahviors of some environmentalists. This is because on the larger issue, in my opinion there are two central questions. The first is whether there is sufficient data to indicate that there is global warming. If so, the second question is whether there is sufficient data to indicate that human activity is contributing to it in a non-minor way. 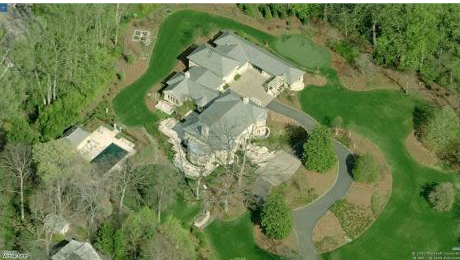 Is Al Gore a hypocrite for flying on jets and owning five mansions? Could be. I don't have enough information on the subject to make an informed decision one way or the other. In my opinion, the issue of whether some environmentalists are hypocrites is separate from the above-mentioned issues regarding the scientific data. Good luck with your blog. I'm a weather geek who only learned of your blog last week when it got a mention on The Daily Dish. I do greatly enjoy your weather related posts. @1:13pm. Thanks so much for re-reading and posting. Let me address your points. The point of this posting was not global warming science but rather the hypocrisy of many of the leaders of the environmental movement. 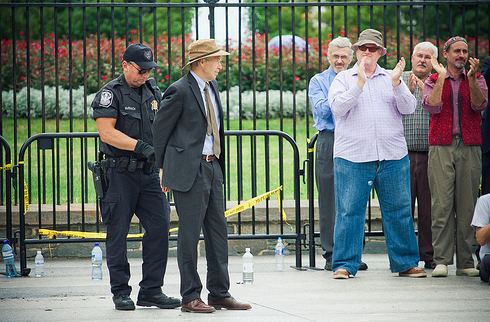 As the D.C. police led them off (per subsequent photos), the bottles remained. People in handcuffs are not allowed to pick up trash. Even if there was a "designated trash picker-upper" (no evidence of that that I can find), the optics are horrible. -- The warming is less than the IPCC estimates (borne out by measurements the last 15 years) and, thus, not a "crisis"
-- The estimates of future warming by the IPCC are almost certainly too warm. -- There are more urgent environmental problems that are both more solvable and would cost less money to solve than "global warming." I advocate solving them while research into how the climate works continues. Please feel free to look around around or search the blog to see my evidence for the above statements. But, we will never get these serious environmental problems (fetid drinking water and malaria in Africa, to name two) solved as long as the environmental movement is increasingly viewed as a joke. Hypocrisy and seemingly being against everything that would be viewed as economic progress ("you are against getting our oil from CANADA??!!") makes it nearly impossible to build political consensus for solving real problems. The environmental movement would be far better off with Ed Begley, Jr. as its spokesman than Al Gore. Thank you again for coming back and I hope you will again in the future!